This soup is a posh cousin of humble Italian Peasant Soup. 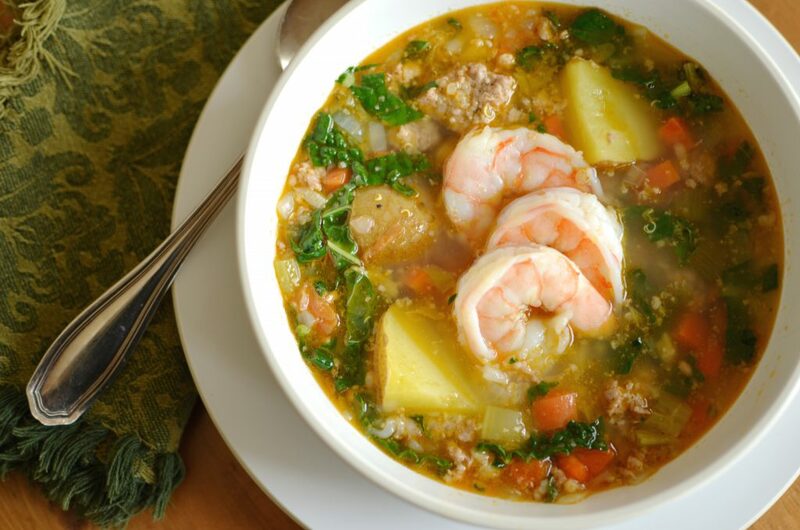 Instead of the traditional faro, I’ve used quinoa, and enriched the soup with a quick and easy shrimp stock. 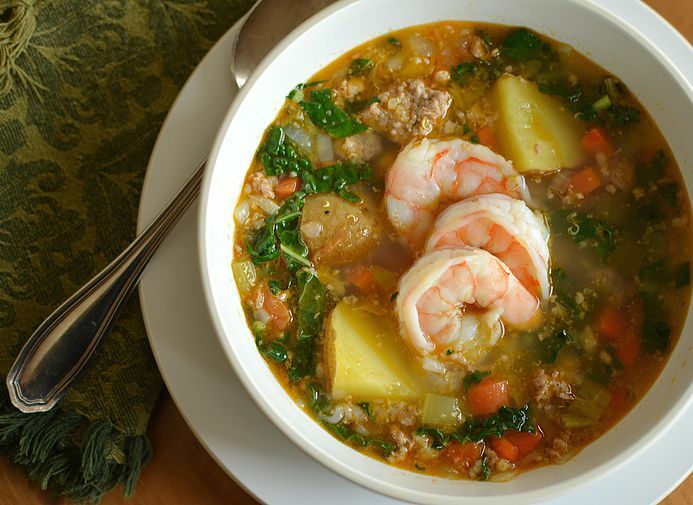 Shrimp and sausage add to this soup’s delicious upward mobility. 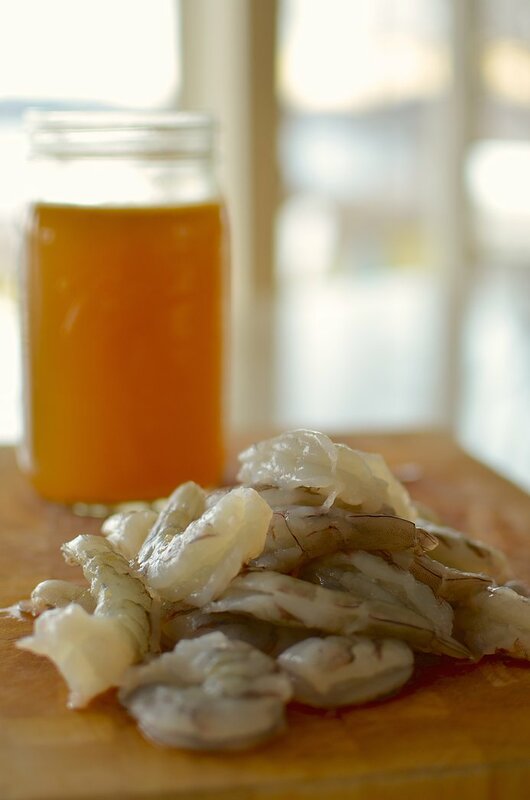 First, make the quick and easy shrimp stock. 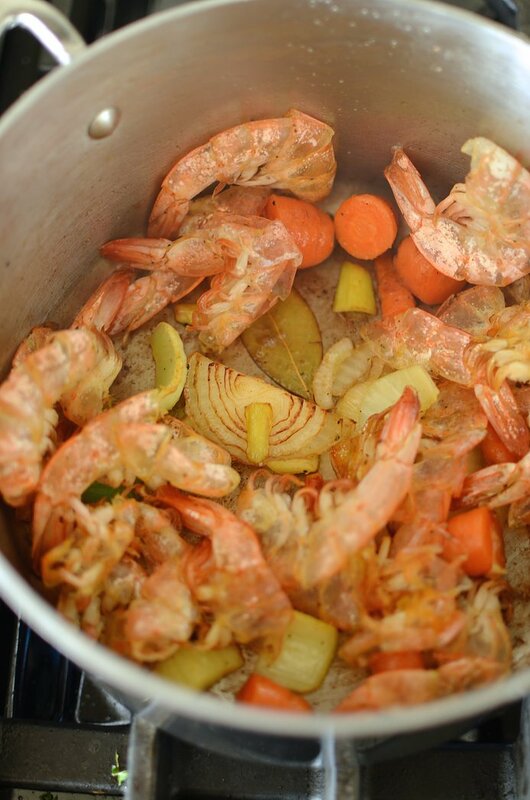 Remove the shells from the shrimp, rinse and set aside. In a heavy pot, heat 2 tablespoons of the olive oil. Add the trimmings from the onion, carrots, celery and one bay leaf and sauté for a minute. Add the shrimp shells to the veggies and sauté over medium heat, stirring for about 5 minutes. 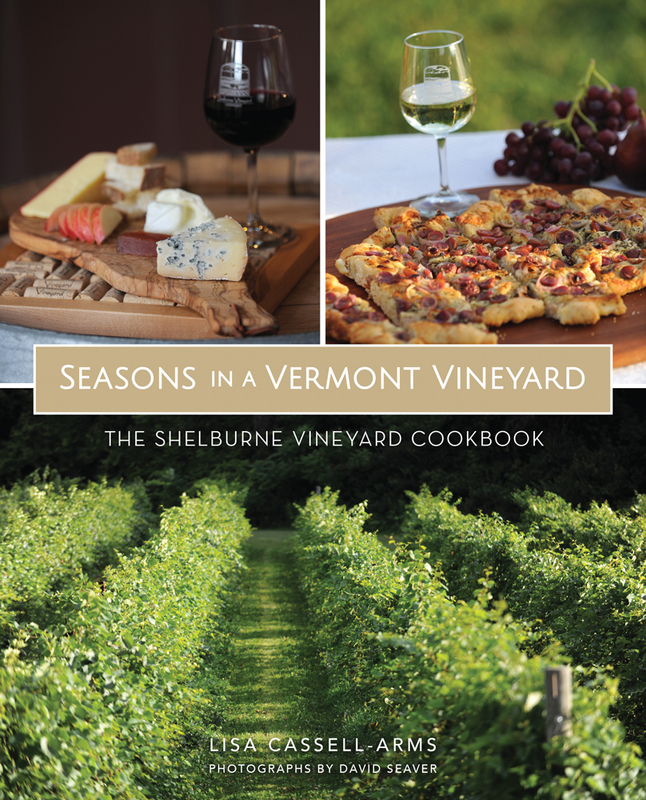 Shells will be pink and fragrant and the veggies should begin to brown. Add 6 cups water and bring to a boil. Reduce heat to low and simmer for about 20 minutes, adding salt to taste. Strain stock and discard solids. In a heavy bottom soup pot over medium high heat, add 2 tablespoons olive oil and crumble in the sausage. Saute until sausage is browed and then remove to a bowl and set aside. Pour off all but a teaspoon of the sausage oil and add the remaining tablespoon olive oil. 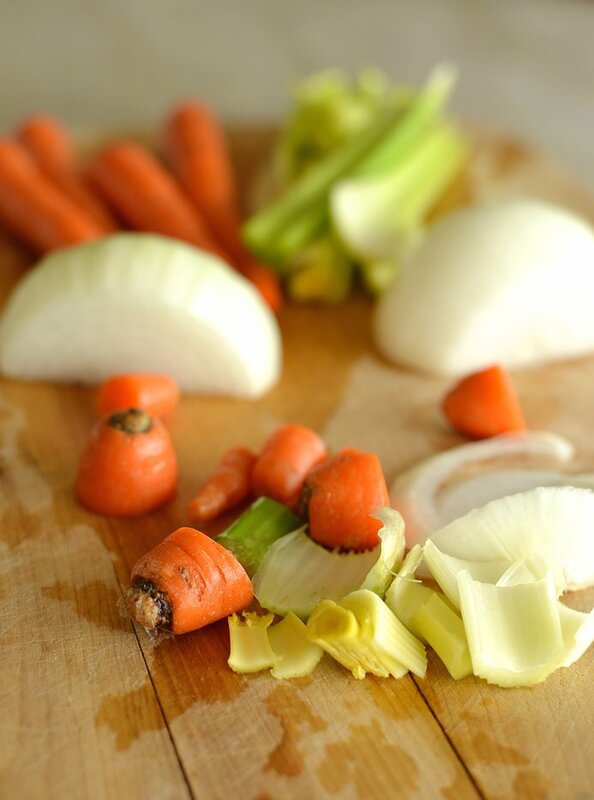 Add onion, carrots, celery and remaining bay leaf and sauté until soft. Add the garlic and sauté until veggies are soft and fragrant. To the pot, add the potatoes, cauliflower florets and the kale. Stir briefly until kale has wilted. Add the sausage back to the pot along with the quinoa and all of the shrimp stock (approx. 6 cups). 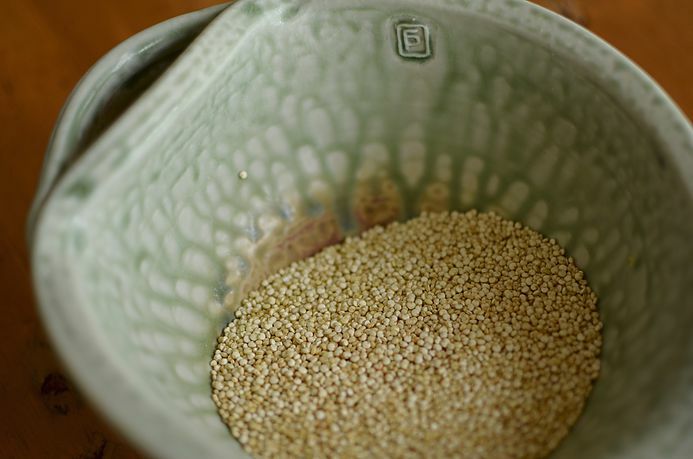 Add another cup of water and simmer for about 25-30 minutes, until the potatoes and quinoa has softened. Add the shrimp and simmer for another 5 minutes until the shrimp has just cooked through. If soup is too thick, add more water and heat through.